First, DO NOT PANIC! Be aware that the release of any chemical or bio agent is likely to induce a fear factor on the part of a largely unprotected civilian population, and that problems with crowd control, rioting, and other opportunistic crime could be anticipated. Extensive attempts must be made to prevent a "panic reaction" among those that might potentially be exposed to a warfare agent. You may be injured by someone else's panic even if you are not exposed to an agent. Protect yourself first, then you will be able to care for your children, family and others. It is not selfish to protect yourself first. Provide for your own air supply, then help your family and those around you. Inhaling the agent is the number one way to become exposed. It is the most likely route of introduction of agents and with the greatest and most rapid effect. Use the protective breathing equipment and/or personal protection equipment that is available. It is important you use this equipment properly or injury or death may result. Follow the instructions that come with your equipment. How to buy and wear a gas mask. When buying a gas mask the most important thing is to check the expiration dates of the filters and the age of the mask itself. There are half-masks that just cover the mouth, but it's a good idea to protect your eyes. Some filters are specialized, filtering out something specific like NBC dust. If you want to protect yourself from the most possibilities you'll need an NBC mask. Place the mask over your face, then pull the straps behind your head. You want a snug fit with no leaks. There should be an air tight seal around the edge of the mask. You'll need to check for leaks. One way is to get someone to dip a Q-tip in some banana oil, then have them wave it around your head while you're wearing the mask. If you smell banana then you don't want the mask. Or cover the intake valve with your palm and inhale. You should not be able to inhale as that would indicate a leak. Uncover the intake immediately. Travel as far away from the targeted area, as safely as possible. Eventually travel upwind of the contaminated site. Do not travel upwind into the contaminated area! If you are indoors, you may enter a small interior room and seal all ventilation spaces. Use a wet towel and seal the space under the door. Listen on a portable radio for instructions. Establishment of a decontamination area and the decontamination of victims/patients/rescuers will be a priority for the emergency workers. Travel safely to a decontamination area. The location will depend on where the event occurred. Ask emergency workers, "Where is the nearest decontamination area?" "Contaminated" patients might not be transported to the hospital. Expect to decontaminate before transport to a hospital. Emergency workers will be wearing protective equipment. They may appear frightening to children. Reassure your children they are there to help. Follow the instructions of the emergency workers. Different agents may require different treatments. Generally, protected medical and rescue personnel must wash the victim with soap and water at the scene. Victims of VX and other non- soluble agents should be cleaned with the alcohol and/or other types of treatments. This must be accomplished as soon as possible, and the specific antidotes then be administered. In the case of most biological agents a diluted solution of common household bleach (sodium hypochorite) may often be effective in decontaminating procedures involving people and equipment. Other antiseptics and disinfectants, as appropriate for the individual bio-toxin, can also be used. Remember, "contaminated" patients might not be transported to the hospital. Expect to decontaminate before transport to a hospital. IMPORTANT NOTE: Each mask is in original and unused condition. However, no representation is made regarding any mask's appropriateness for any particular application or use. Sale of this item is restricted to addresses within the Continental United States. 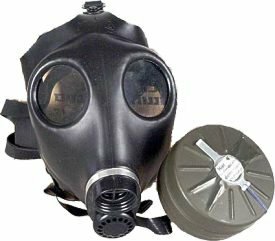 Gas masks are not effective against all contaminants and gas mask filters have a limited shelf life and must be in working order to be effective. Filters may not be effective for a lengthy period of time depending on the nature of the contaminant and how widespread it may be. These masks are not appropriate for children, nor will they protect from anthrax if it comes in contact with the skin and is absorbed in that manner.Please allow up to 2 weeks for delivery.